Many have asked me how I personally think about governance and assess governance when I visit countries. 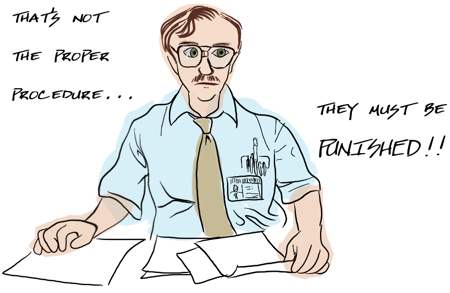 I have a new working paper that presents my thoughts on this. These thoughts manifest in what I call an ends-means approach to looking at governance. I focus on ends as a starting point in looking at governance because these reflect the revealed functionality or capability of states—what they can do. I think that revealed capabilities and ends are ignored in much of the current governance discussion because of a bias towards questions about form and preferred means of governing. The bias manifests in reform programs that introduce commonly agreed-upon and apparently ‘good’ means of managing public finances, structuring regulatory frameworks, procuring goods, organizing service delivery, managing civil servants, and much more. The bias is even reflected in views that governments should be transparent and non-corrupt and have merit based hiring procedures. I am sure we all want to be in governments that look like this, but do appearances matter as much as action? And do these appearances always promote the action needed from governments, especially in developing countries? 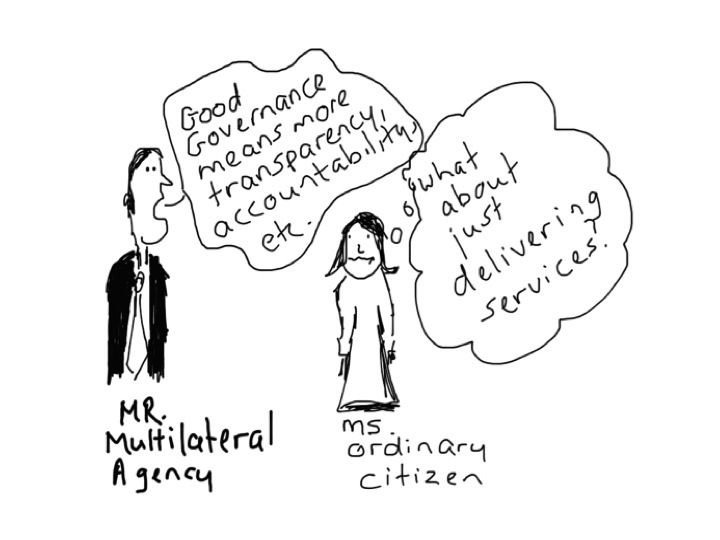 In promoting a form based governance agenda (of what we want states to look like), I think we (as a community of governance observers) often forget that governments exist to do and not just to be. We thus focus on the means of being rather than the product of doing. This bias leads to governance indicators and reforms that emphasize perfection of means, often failing to make a connection to the ends or even clarifying which ends matter. (Or allowing for the idea that different ends might matter in different places at different times or that different ends might justify and even warrant different means in different countries or even sectors in countries). This is particularly problematic in developing countries where governments are only five or six decades old and are still defining and creating their ends and their means. Approaches to governance should help in this process of defining and re-defining, but this help should start by emphasizing ends—what governments need to do to promote development for citizens—and then think about means—how governments could do such things. The first section of this new paper makes the argument for focusing on ends and then means. The second and third provide details on the ends and means I typically look at; identifying seventy of these to get as full a picture of governance as possible. 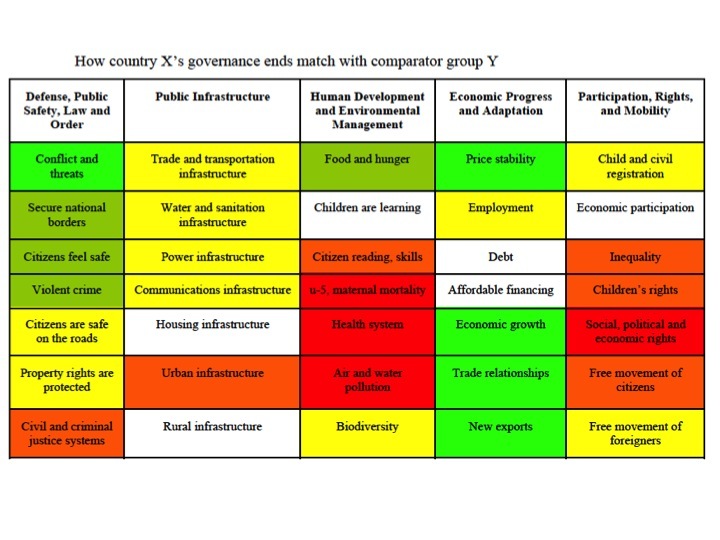 A fourth section then discusses why I do not use stand-alone, hold-all indicators of governance to present this picture. The next section introduces my own way of actually looking at and analyzing governance data: Using comparative, bench-marked dashboards and narratives instead of stand-alone indicators. I build a dashboard example to show how it allows a view on the multi-dimensional nature of governance and fosters a conversation about strengths, weaknesses and opportunities in specific countries. Here is what it looks like. For details you will have to read the paper, but the idea is that one picture—made up of 70 pieces of data—illustrates how a specific government compares with others on important ends and means. 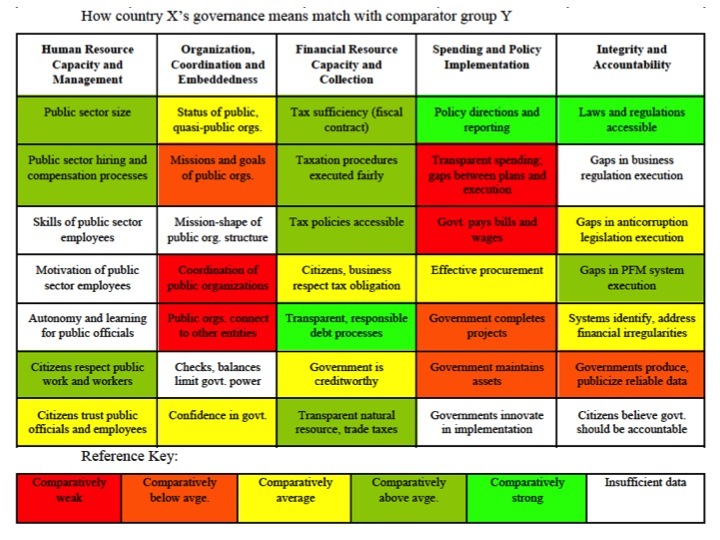 The variation in colors reflects the variation in governance characteristics and performance, which is commonly evident in countries. Hold-all governance indicators commonly fail to show this variation, averaging it out instead of revealing it as key to getting a full picture of the governance situation in any state. I don’t intend for this to be an academic treatise, but offer it as my personal viewpoint on an increasingly important topic. Think of it, perhaps, as an exercise in ‘thinking out loud’. As such, the paper is a cover-all piece on my views about this subject to date, which one will see in the references to my work, including articles, blog posts, formal figures and tables and less formal cartoons. Hopefully the totality of this work provokes some thinking beyond my own. In particular, I aim to contribute to the discussion about including governance indicators in the post 2015 development indicator framework. The final section of this paper offers specific ideas in this regard, intended to build on already-important contributions.